Grain storage bins, in another name is grain storage silos or steel grain storage silos, which is used for farm purpose, rice mill, flour mill, soybean-oil mill, animal feed mill plant, brewery plant and so on, the high quality steel grain storage sbins can be used to store grain (such as corn, maize, bulk wheat, corn, rice, paddy, sorghum, soya etc. ), animal feed, cereal seeds, plastic pellet, wooden pellet etc. 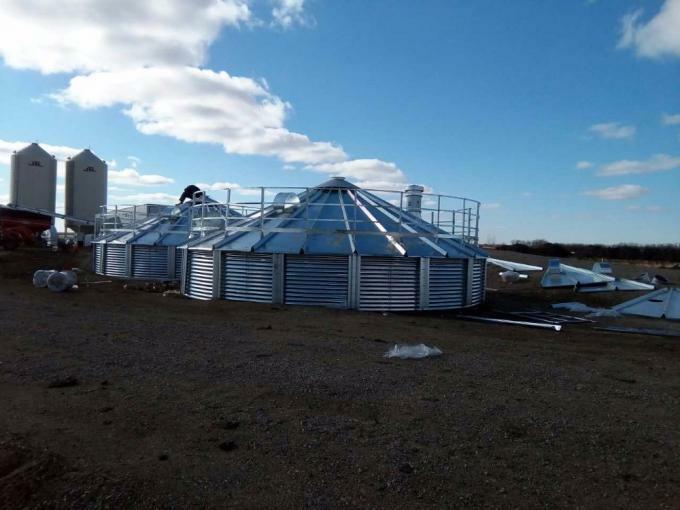 Include grain storage bins silo roof handrail, roof vent, manhole and door, safety handrail is set on the roof as our standard design,corrugatd steel silo roof is made of galvanized sheet. 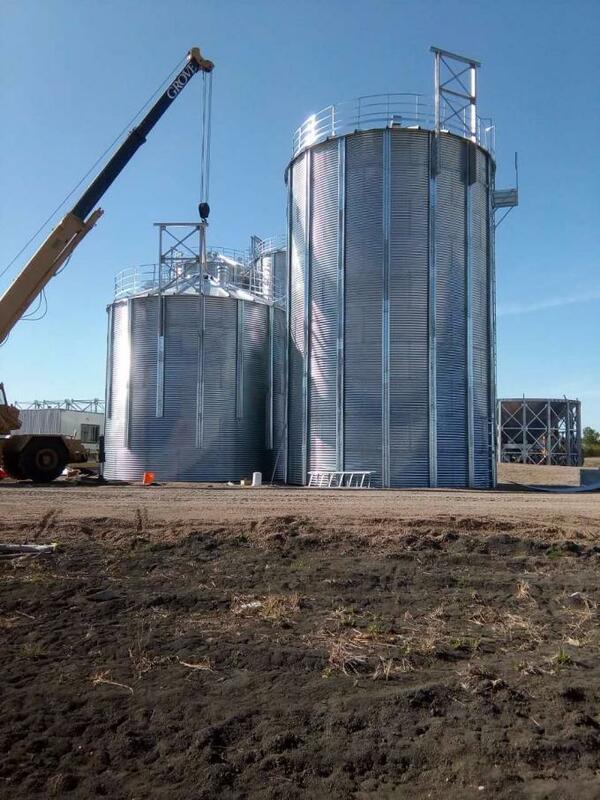 2) Grain storage bins body sheets are connected by high yeild bolts, the thickness of corrugated steel silo sheet is designed according to the constant strength theory. 3) There are stiffeners fixed on the body ,which is used to bear the vertical friction force and support the storage silo body;The bolts and nuts are fixed with spherical waterproof washers. 4) There are Aviation special waterproof rubber strip between the storage silo sheets. 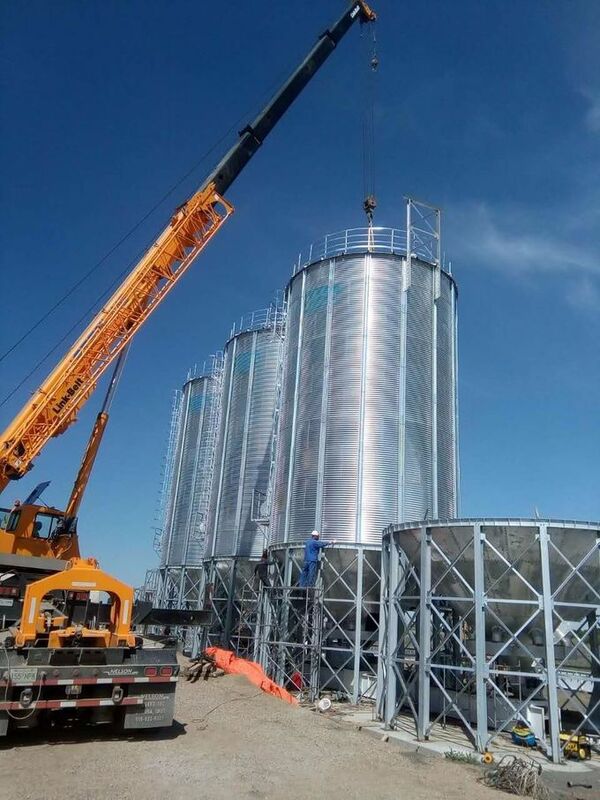 Galvanized grain silo is equipped with round door, inside and outside ladder, ladder protecting wire net and ladder platform. Grain storage bins steel cone base is composed of upright columns,annular girder,cone plates,tie pieces etc.the upright columns are made of national standard I-shaped steel and I-shaped steel is cone of the most widely used steel types in steel structure design and manufacturing.It has good structure stability and reliability. 1.Steel sheet use high quality galvanized sheet,all parts are standard parts, Strictly follow the relevant national standards of silo design, manufacture and installation. 5. The silo diameter from 2.7m-32m . 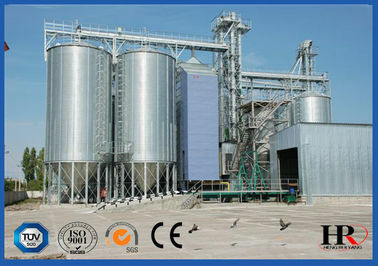 The assembly steel silo widely used in grain and oil, Chemical, brewing, medicine, food , cement , coal and other industries.